Can someone tell me again WHY we sold him MORE property? Sunday afternoon I went to Crown Candy for an Easter bunny and cherry malt fix. 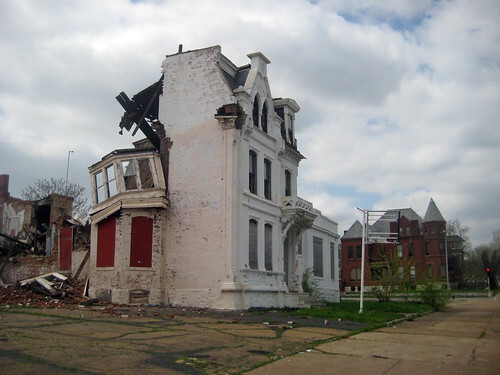 On the way home, I stopped abruptly when I saw that the devastation of the Winkelmann mansion located at 1930 St. Louis Avenue has worsened greatly. The mansion was purchased fully intact in 2006 by N & G Ventures LC, a Paul McKee shell company and transferred to Northside Regeneration LLC in 2010. For the last five years the mansion has been under attack by brick thieves, and has now reached the point where its final destruction seems inevitable. 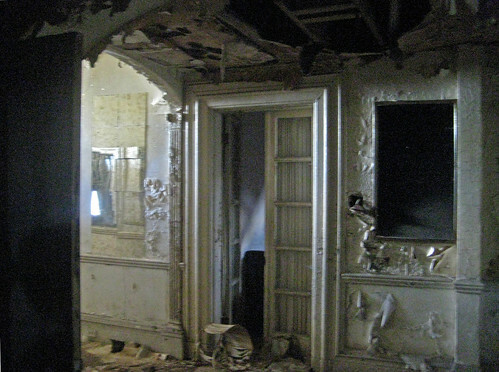 Just a mere year and a half ago, while most of the later additions to the mansion and its original rear ell had already been largely destroyed, the main portion of the original three story mansion was still quite intact and very much salvageable. If the main portion of the home had been secured, stabilized and protected, there is no doubt that the mansion could have been mostly saved and rehabilitated. See this post from September 2009 for more exterior and interior photos of what was then still intact. Today however, not much is stable beyond the beautiful front facade. 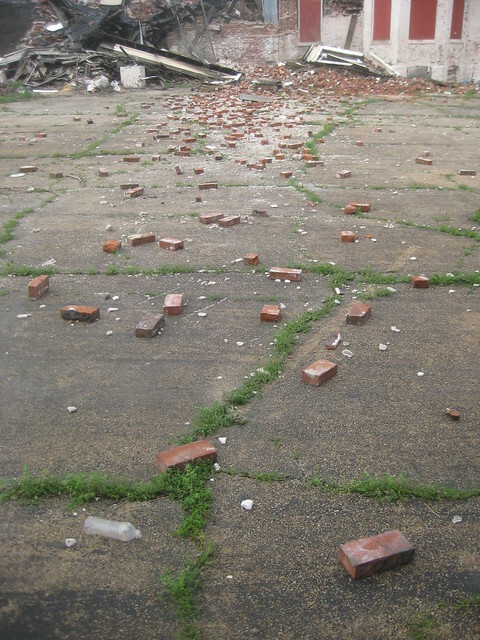 The rear and much of the east walls of the mansion have evaporated and the roof and third floor have largely collapsed. The remaining pieces of the once elegant east bay window now hang precariously. By this time next year, this is probably all that will be left. Will the Clemens Mansion be next to fall prey to this blatant criminal neglect? 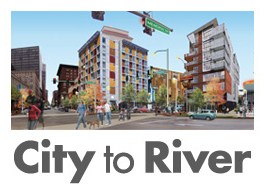 Just last month, the City of St. Louis agreed to sell McKee 1,233 additional parcels and buildings totaling 162 acres. With this type of disregard for the hundreds of properties already owned including so called "heritage properties" I'm still trying to figure out WHY? 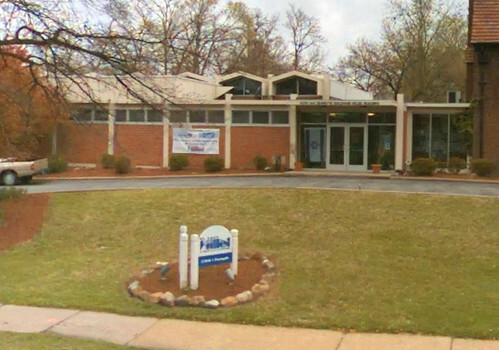 Last year Hillel at Washington University sold its modern multi-purpose center, the Alvin & Jeanette Goldfarb Building, to neighboring Forsyth School to the east. 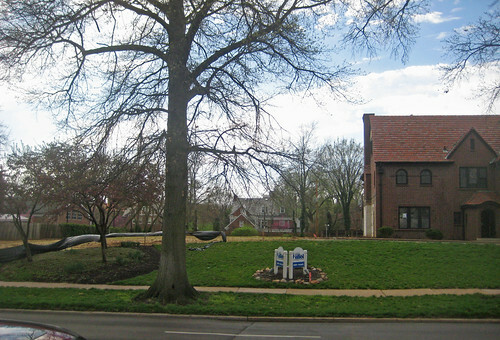 The structure, a circa 1966 addition to a 1920's mansion on Forsyth Boulevard was demolished in January of this year. I was unable to find information about the buildings architect, so if anyone happens to know, please share. The building was not a masterpiece, but I always thought the clerestory structure over the auditorium/dining hall space was interesting. The view of the clerestory from Forsyth had unfortunately been compromised by the addition of mechanical equipment and a screening structure on the roof of the front portion of the building. Forsyth School has expanded several times in the last decade and according to an article in the Business Journal, had apparently attempted to purchase a home at 6214 Forsyth from Unity Christ Church, but lost out to a competing bid from Washington University. The now vacant site, which straddles the St. Louis-Clayton border across from Wash U's Givens Hall, will likely not stay vacant too long as Forsyth School has hired an architect to look at the scope of a new addition, and the school is embarking on a $7 million capitol campaign. 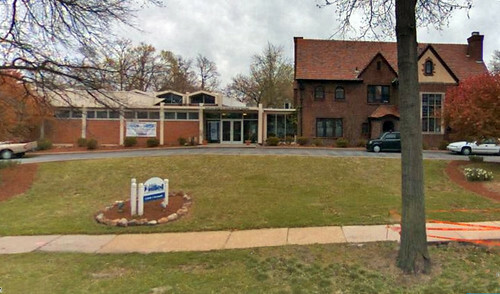 Hillel is apparently considering an addition to its remaining property at 6300 Forsyth. 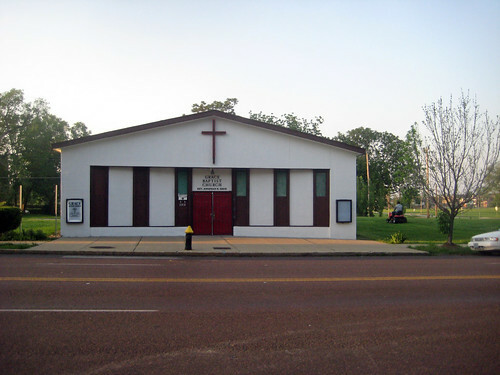 The now demolished modern structure was located in the Wydown/Forsyth National Register Historic District, but was a non-contributing building. The official map of the historic district in fact lists buildings in the district constructed after 1939 as "intrusions". 3:00 pm today will mark 40 years since the implosion of the first of 33 towers at Pruitt Igoe, bringing an end to one of the largest social experiments of its kind. The recent documentary movie The Pruitt-Igoe Myth downplays the role of Hellmuth Yamasaki & Leinweber, the projects architect, which is appropriate since most reviews up to that point had failed to look at all of the circumstances that resulted in Pruitt Igoes demise. By no means does Yamasaki deserve a Get out of Jail Free card though. The truth of the matter is that the architects, the city planners, the police, the City's government, the State, the Federal government, and everyone in between ALL failed and failed BIG. In the fictional movie The Matrix, this was called this System Failure, but here in St. Louis, it happened in real life. Ridding the North Side of the single largest failure in St. Louis' history, and perhaps the largest failure of its kind, did not leave the area without problems. Whether you believe the conspiracy theories of the Team Four Plan or not, there is no disputing that depletion did indeed occur on a massive scale. 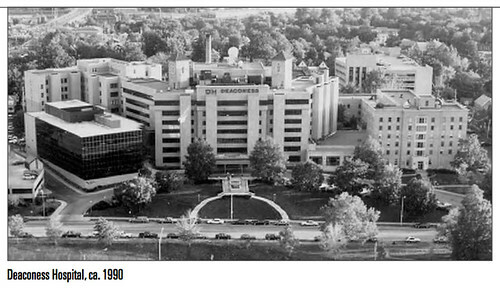 It was already well underway when the last building at Pruitt Igoe fell in 1977. Abandonment, ensuing decay and demolition spread like cancer over the decades and large scale developer speculation has only accelerated the process which in many areas has reached the point of almost of almost total elimination. 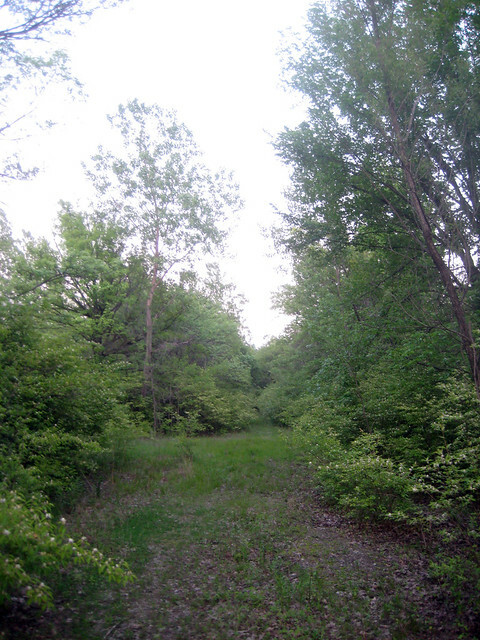 The enormous scale of the failure of Pruitt Igoe is sometimes hard to grasp. Even today if you visit the wilderness that has overtaken the site over the last 35 years since the last tower fell, it is difficult to imagine. The Puitt Igoe flyover scenes in Koyaanisqatsi - Life Out of Balance feel eerily disconnected from reality, yet recently when I was watching I noticed one brief glimpse between the towers that brought it back to present day. The appearance of the Grace Baptist Church just across Cass Avenue from the Pruitt Igoe site has not changed in the time since the towers were still standing. This afternoon at 5:30, a picnic hosted by Reclaimed Spaces will be held on the Pruitt Igoe site. 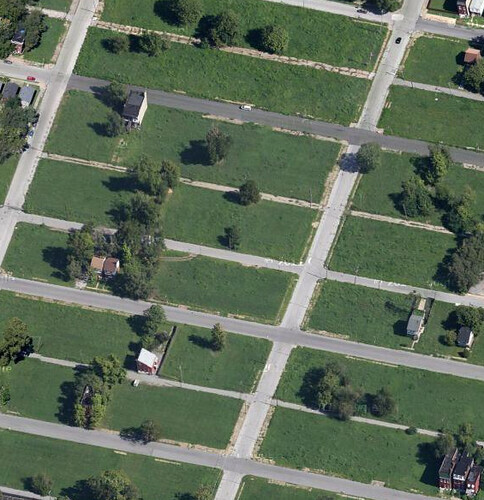 Today marks the closing date for submissions to Pruitt Igoe Now, a design competition intended to solicit new ideas for the long vacant site. I have chosen not to participate in the contest because I have absolutely zero confidence that we have come far enough in the last 40 years to resolve the issues which led to such an enormous failure. 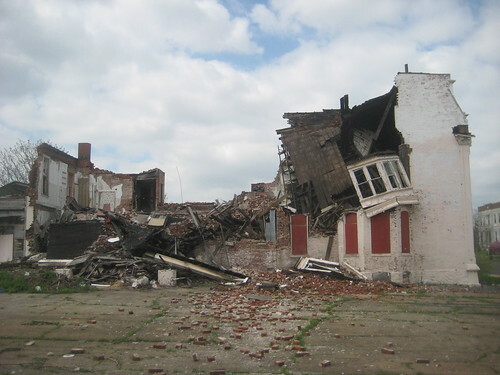 Since the implosions, every scheme so far to redevelop the Pruitt Igoe site and surrounding areas, from a light industrial park to a golf course community to the ill-defined latest and most controversial, Northside, has fallen flat on its face. Even if there comes a time when the deeply seated issues that divide this region are able to be overcome, and even if by some miracle, Northside is able to succeed in redeveloping the entire area around the former Pruitt Igoe site into a thriving neighborhood, I'm of the opinion that it should stay much like it is, but oped to public use as a nature reserve. Other than Kennedy Forest in Forest Park and some small pockets of leftover space here and there, the remaining portion of the Pruitt Igoe site is only space within the City or inner ring or suburbs that is truly wild. We have a lot of great park space, but the majority of it is neatly manicured. 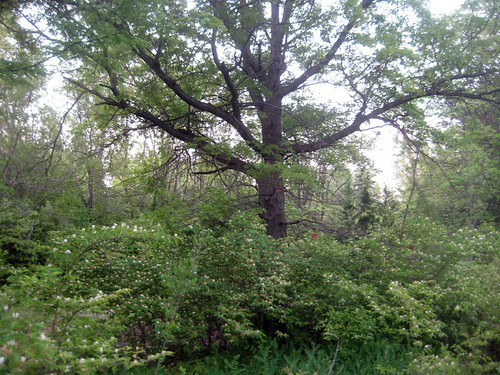 If we bulldoze the Pruitt Igoe wilderness for a grocery store or some tract houses, it would be very easy for future generations to completely forget what happened there, and that would be a mistake. I almost thought it was a joke when a friend IM'd me the link to the press release late yesterday morning. After looking it over a few times though and remembering "oh, right I'm in St. Louis, of course this could happen", I realized it was not a joke, but a real proposal. 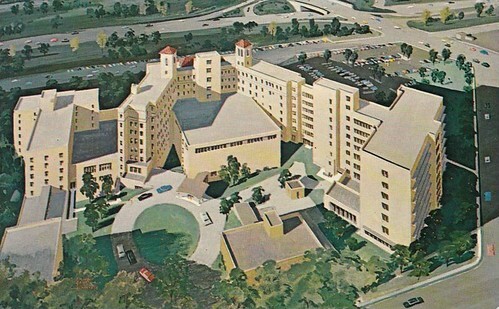 The St. Louis Zoo is under contract to purchase the former Deaconess Hospital complex (more recently as Forest Park Hospital), with intensions to demolish all the buildings except a 1970's office building and a parking garage and replace them with parking lots, drop off and loading zones with the possibility of some kind of people mover transportation system crossing the highway. 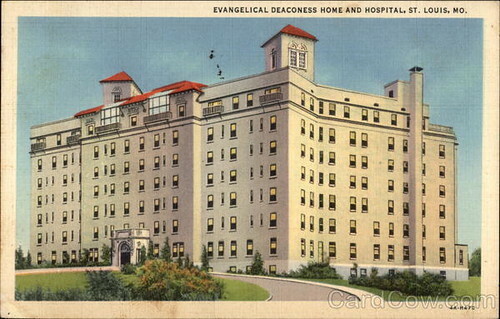 Unlike most of my posts, I'm not necessarily advocating for preservation of the main hospital building, which was opened in 1930. The original structure has been severely altered by additions and a complete slip-cover. While it might be possible to remove the slip cover and the windowless bathroom towers that are tacked onto almost all of the buildings facades and potentially get the original building listed on the National Register (see the former Post-Dispatch building at Olive & Tucker), potential uses for the building would be limited... maybe senior housing or possibly a hotel. 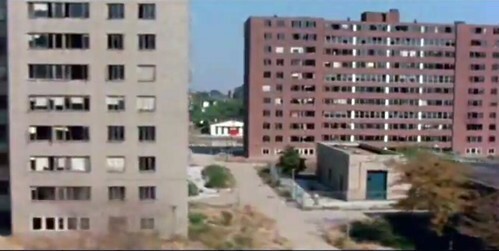 If the building is demolished though, it should be only after exploring all possibilities. 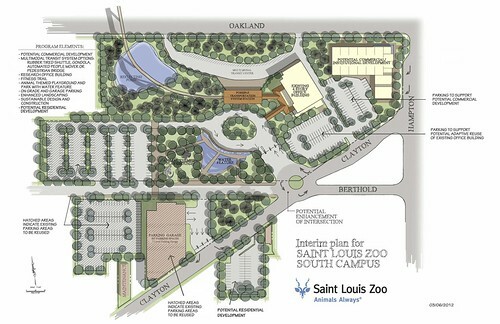 I can see the positives for the zoo, which would gain additional space for veterinary, lab, research, and other uses. Having an additional overflow parking area might be considered a positive too, however just last year the Forest Park Trolly was introduced with the goal of reducing congestion and parking immediately around the zoo and other popular attractions as well as making use of large existing under-utilized parking areas such as the Muny upper lot. One of the goals of this program and the media campaign put out by Metro, MoDOT, the CVC and Forest Park Forever was to get people to use other highway exits than 40/Hampton (which often backs up onto the highway) and other park entrances to access the attractions. So which exit do you think people will use to get to the new parking on the hospital site? While I'm glad to see that the zoo is planning for commercial development at the corner of Oakland & Hampton, which is now occupied by a low-rise parking garage, much of the rest of the proposed site plan shows the areas now occupied by buildings filled with an overly large oval drop-off zone, expanded surface parking and a large reflecting pool... not exactly the best and highest uses for a prime site facing Forest Park. Additionally, one of the items listed on the press release for long term uses is the potential for additional "fitness trails, playgrounds or water features"... so people can use these instead of going to Forest Park and using the ones that are already there?! Seriously, I'm not making this up. Hopefully in the long term, the zoo will see that replicating features already in Forest Park is not the answer, and dedicate more of the 13.5 acres for other uses be they commercial, mixed use, and/or additional new support facilities.